60-70 People gathered at Frankie Z's to watch John Kerry accept the nomination as Candidate for President of the United States. Veteran volunteers mixed with Campaign neophytes in both the front room and backroom of this distiguished Chicago location. TV's in the front and back -- including the huge screen in the back -- were all tuned to the proceedings in Boston. It was the perfect environment to watch the event. Particularly popular with the crowd was the speech by Clark. It drew a lot of applause. Max Cleland's speech also received a warm reception. Of course, the man of the moment, the person we all came to see, received the longest and most substained applause. A cameraman from ABC/7 was there to document the feelings of the crowd as Kerry began to speak. We leaped to our feet and did so several times as Kerry, through his words and delivery, made it clear why he's the right man for the job -- why he's going to be the next president of the United States. Thursday night was truly a special volunteer occasion. Slightly under one hundred excited Kerry volunteers gathered in the "upper room" at the Firehouse Grill including many new faces to hear the last night of the convention. What a barnburner it turned out to be! However, the biggest cheer and standing ovation of the night before the acceptance speech was reserved for former Sen. Max Cleland. Max represents the truth about this current administration simply put, there is no lie too big or insidious for this administration when they attempt to hide behind the flag and as they try to strip Americans who don’t agree of their patriotism. And what can we say about Kerry's speech? He DELIVERED! What a fantastic speech! "I'm John Kerry, and I am reporting for duty" brought people to their feet from the start. He hammered home the message that Democrats are the optimists in this race. You go JK! See Photo Gallery - Chicago / Photo Gallery - Evanston. Your IL delegates have finally managed to get to a computer over here in Boston. We're getting ready to head over to the convention center for JK's speech on this final big night. We've got a ton of great pictures that we'll post upon our return (Asim with John Glenn, Tanya with Clark, Gary with Obama, Nora with Teresa, ...). The energy couldn't be higher in this city. We are so ready to win! Here's a quick wrap up of what we've experienced so far. Security is real tight, but they're treating us all very well. Walking around the hotels and on the convention floor has been so much fun meeting other great volunteers & Kerry supporters, exchanging stories and buttons. The Democrats are unifying -- it's really great. LaRouche people have been hounding the Back Bay Hilton where the IL delegates are staying but no one is picking up their "democratic platform" packets. It's exciting to be around so many political bigwigs all of the time. It's quite an experience. The freebies are out of control -- bags, t-shirts, pens, stuffed animals, buttons, cameras, cookies, donkey shaped mac n' cheese, candy bars, hats, ... We're collecting things to bring back to the gang. Every night they pass out a ton of signs to hype the crowds. We'll be bringing back some of those also to decorate our new office once Avis is able to secure one for us. We're losing our voices from yelling so much. Our feet and knees are sore from this non-stop fun. This has all been about getting us on the same page, getting energized about our party's ideals and message, focusing on what steps we all need to take to cinch this election. We are way positive and super psyched to win big in November. One thing is clear, though. Everyone is saying that this is the most important election of their lives. We have got a lot of work to do before November! We all need to deliver the message of John Kerry and John Edwards through our own networks and we have to grow our outreach to spread this message to all of the voters of Illinois one on one. We need to grow the Democratic party! We have to make more Illinois residents voters! We need to reach out to the young voters, to the single women, to the GLBT community, to the African American community, to the hispanic community, to EVERYONE! People on the streets were already asking us about Obama -- his reputation was high even before the speech. There was a party for him at the Harvard Faculty center beforehand. Clinton's speech was amazing. Tuesday was all about IL at the convention. Before the convention started there was a nice reception at the swanky (and expensive! Thanks to Asim's boss!) State Room with live jazz and political shmoozing. because they can't vote but they are our future! speaker so far that has done this. It was amazing. Elizabeth & John Edwards were awesome, too. We got to vote for nominee, too! Yay! Roll call! Approximately 65 people attended a Democratic Convention Party at the Schell house last night to celebrate our party’s attributes and speakers. Everyone in attendance gave all of the speakers shining reviews and often through the night, loud thunderous applause was heard coming from the third floor (for those fortunate enough to find an available seat in the theater room) and the family room, where TVs were set to C-Span. Throughout the night, I kept hearing from everyone that watching the convention with a crowd of people was much more entertaining and fun, than you sitting at home and watching it alone. The observations and responses to each speaker were always interesting. Sometimes a party guest would make a comment to help clue others into where the speaker was trying to lead the audience. It was fun hearing Bonita point to the Illinois delegation and say, “Isn’t that Alex?” Alternatively, I kept hearing her say, “I think I just saw “Bonnie”. Anyway, just as he was the big hit of the Boston Convention, Barak Obama, was a big hit here, also. What a connection he was able to make with all of us. Someone asked if we thought he had written his speech and without hesitation, many of us responded, yes. Of course, Michelle his wife, I am sure had a little something to do with it, but he carried the night with his incredible intelligence, warmth, and global vision. Someone commented that he had just made Senator Kerry’s job Thursday night a little harder. How could anyone outperform that performance? Leave your comments here. Who'd you like? What speech or comments did you remember? How was the coverage -- was it fair and balanced? Were you with other people? What did they think? 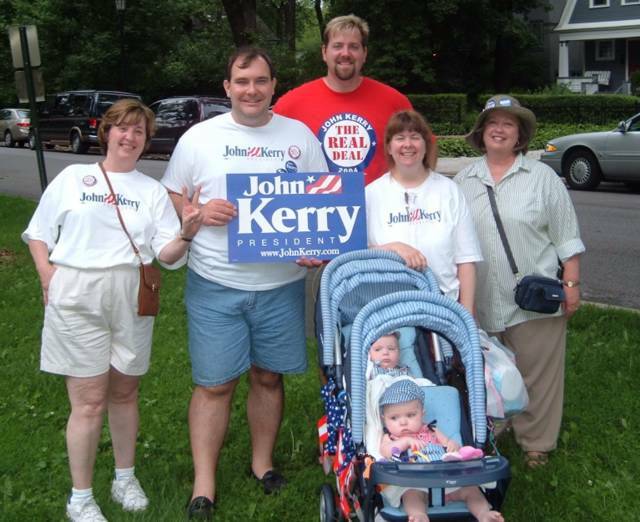 Eager Kerry volunteers swarmed into two events over the weekend at the Taste of Lincoln Avenue and Summer on Southport. The first event was organized and led by Kathy Karsten and the second by Visibility Coordinator Jen Lyng. At the second event alone, seven (!) volunteers showed up to hand out stickers and take down names and email addresses. 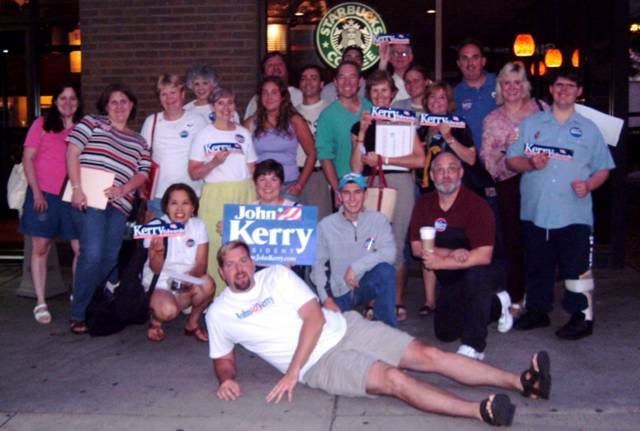 We also had several new people who heard of us either through our own website at chicagolandforkerry.com or through the John Kerry Volunteer Center. Kerry volunteers are reaching out and spreading the word about the Kerry-Edwards Bandwagon. This weekend's draw is a great harbinger for future big events like Venitian Night (7/31), Bud Billiken (8/14) and of course the Air & Water Show (8/21-8/22). For more information about events, see the Events Section. As usual, the Goose Island Meetup was a diverse group of about forty people, containing several attendees new to Meetup as well as seasoned veterans. Josh Lange hosted the event, and provided flyers regarding upcoming events as well as information on John Kerry and John Edwards (have you picked up your Time and Newsweek copies yet?). Speakers for several committees were present, and Visibility and Outreach gained significant recruits. Media member Betsy Storm raised some money for new buttons and stickers. August will highlight fundraising, trips to swing states like Wisconsin, and will feature new literature. George Bush was in Illinois for another staged photo-op at a Northeastern Illinois Public Safety Training Academy where he toted his administration’s accomplishments on homeland security. 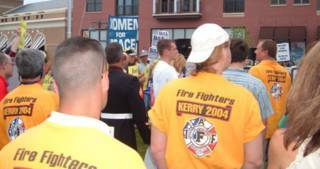 Over 150 protesters filled Navy Park in Glenview to let George Bush know what they thought about his hypocrisy of “mouthing” support for homeland security while gutting the funding for First Responders like the police and firefighters and gutting benefits for veterans. Firefighters and veterans were the most visible supporters in audience. Protestors heard from US Representative candidate in the 10th Lee Goodman, Illinois IAFF representative Edward Crews and former Marine Dirk Enger, Alex Armour from Jan. S's campaign, Lauren Beth Gash and other great speakers. Go read John Kerry’s speech on Homeland Security to learn about what President John Kerry will do to make Americans more secure. With over 80 people signing in at the Evanston Kerry MeetUp, held at the Firehouse Grill, 750 Chicago Avenue, on Thursday, July 22, the electricity in the room was almost overwhelming. Our MeetUp Host, Robin Trilling, kicked-off the meeting by declaring this election to be the most important election in her lifetime. She reminded everyone that with three months to go in this Presidential Campaign, there was still plenty of work to accomplish and although the campaign is going well, we can not afford to ease up for one minute in our support of the Kerry/Edwards ticket. There was no shortage of people wishing to volunteer for the Kerry campaign, and within two hours when the meeting was ending, nearly everyone in the room had signed on to help with either voter registration, event planning, communications (phone calling), or joining the Media Corp. Team. Prior to breaking into groups, however, Democratic State Senator Jeffrey Schoenberg, who had returned in time from Springfield to address our group, presented his impression of how important this Democratic Presidential election is to the Party and why it is important for everyone to do their part to elect our candidate. Senator Schoenberg said that after being warned that there could be a lite turnout for the MeetUp since a lot of people were away on vacation, he was shocked when he walked into the room to find such a large crowd. The other speaker for the night was Hollister Bundy, a Godson of John Kerry, who related to the audience many personal stories about John Kerry, which served to give everyone a better perspective of the man, as a person. Hollister really told some heart-warming stories that spoke to the caring and warmth of Senator Kerry. Skokie, Wilmette and other nearby communities were represented at last Thursday's meet-up. Getting involved in a variety of volunteer activities was the theme for the evening as Kerry-Edwards supporters met at Edwardo's on Skokie Boulevard. John Lee Bingham, a volunteer representing Veterans for Kerry, gave a rousing talk that included a solid list of reasons to support the Kerry Edwards ticket. 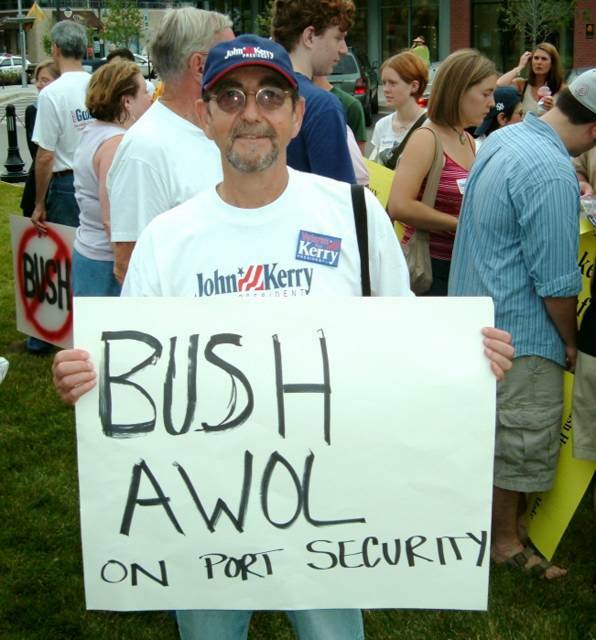 He encouraged pro-Kerry rather than anti-Bush rhetoric, shared a number of things we can all do (wear those Kerry-Edwards buttons all the time, not just for meet-ups! ), and gave tips for working visibility events. We were also pleased to welcome Michele Bromberg, 17th District Candidate for State Representative. Michele familiarized everyone with her candidacy, her experience and concerns, talking especially about health care and education. Both speakers answered questions and encouraged a good amount of dialogue among supporters. Everyone present signed up for volunteer activities from phone calls and canvassing to travel to battleground states. Despite a setback with getting listed as an “official” designation on Meetup, the Park Ridge Meetup overwhelmed expectations last night busting out of the seams at Starbucks with 24 people in attendance. New Meetupers were added from a visibility event the team conducted a few weeks before at the Park Ridge Arts Festival and phone calls made by Monica and Bruce to remind volunteers to come out. The groundswell of Kerry excitement continues to grow in Park Ridge. Watch for the Kerry – Obama tsunami in November! Special thanks to Monica for directing the meeting and gearing volunteers up for the Taste of Park Ridge event this weekend. Kerry supporters gathered once again at Ann Sather's on the North side on Thursday July 22 to show their support for our candidate and his new running mate. A lively crowd of about thirty were in attendance with many newcomers to the group. Agenda topics included the several upcoming visibility events as well as outreach recruitment and opportunities to battleground states in the near future. The enthusiatic crowd took part in breakout discussions that included engaging feedback around John Edwards and his strengths on the campaign trail, the healthcare challenge that is a key issue in the election, as well as lively talk about the recent "Outfoxed" movie that is causing quite a stir in the conservative camp. Attendees left interested, motivated and ready to take their passion to the streets as we lean into the next few months of momentum building campaign fever. The meetup was hosted by Joey Hampton, Dan Pawlus and Leo Robert Klein and a concerted call out to South and West side Meet-up expansion was put to the group. Armed with Kerry/Edwards materials hot off the presses, we handed out stickers, buttons and the newsletter at the Friday opening of the Old St. Pat's Block Party. With only one entrance to the party, we had great traffic, and also managed to sign up some new volunteers. Before you head out to your local block party this summer, please contact the Visibility committee for stickers and/or buttons. We can cover many neighborhoods while having a great time socializing with voters and possible new volunteers. Kerry Volunteers were doing a Land-Office Business just getting a sticker to everyone who wanted one at the opening night of Millenium Park on Friday, July 16. People waited in line to snap up the familiar blue Lapel Stickers. Mothers and fathers would request them not only for themselves but for all their children. Old people, young people, people of all races and backgrounds eagarly snapped the things up. We could hardly peel them off quickly enough! This was one of the biggest events of the season. The popularity of the symbol -- a simple sticker -- was a great illustration (as if we needed one) of how greatly the people of this city and state identify with the campaign to elect John Kerry president of the United States. It was a wonderful event. Close to forty enthusiastic Kerry supporters attended this week’s Salon Kerry Night at the Firehouse Grill, 750 Chicago Ave., Evanston, for a night of campaign discussion, strategizing and friendship. Missing our leader, Daniel Dennison, who was away on business in California, we sailed the ship without him. Nevertheless, to Daniel’s credit, the Core Kerry Team did not miss a beat at welcoming our newcomers and making the needed weekly announcements. DJ Wednesdays at Grant Park is really turning out to be a fabulous regular event. Enthusiasm for Kerry is palpable. DJs last night included DJ ESP Woody McBride/ DJ Josh Werner (Techno). They wowed the crowd with a distinct electronic beat. The big news was the Obama people who came and joined us (Yea! Obama). They really made the concert seem like a truly Democratic Event. Leo in an effort to reach out, made friends with several Republicans, pointing out that Bush would continue to have problems until he came up with supporters who could dance as well as us! Yeah, I know, fat chance. At least on the dance floor, we've got this thing sewn up! See you next Wednesday. You heard it first on ChicagolandforKerry blog on June 30th. Now the Kerry campaign is confirming our earlier speculation. Barack Obama will deliver the Keynote address at the Democratic National Convention per a Kerry press release. "Barack is an optimistic voice for America and a leader who knows that together we can build an America that is stronger at home and respected in the world," said Democratic Presidential candidate John Kerry. "He understands the importance of building an economy that lifts up families and expands opportunity, and I'm honored that he has accepted the invitation to deliver the keynote address." Keep the Pressure on Bush! July 11, 2004--In Illinois, the latest Rasmussen Reports survey shows Senator Kerry with 53% of the vote and President Bush with 37%. Keep up the good work Chicagoland. Let there be no doubt in November how Illinois feels about this election. Volunteers registered more than 55 voters at last Saturday's Folk & Roots Festival in Lincoln Square. The question, "Are you currently registered to vote at your current address?" (repeated over and over throughout the day) encouraged many to be sure they were ready to vote on November 2. A grassroots volunteer committee, known loosely as VR Kerry ('VR' for Voter Registration) and organized by Chicagoan Cara Hendrickson, has been attending Democratic-leaning events across the city in preparation of the November election. The Folk & Roots Festival was Saturday's choice. Saturday's volunteers included: Maryann, Aaron, Cherie, Diane, Karen, Kathy, and Jennifer. Interested in getting involved? Visit the VR Kerry Yahoo Group or e-mail jennifer. Edwards in Chicago July 14! On Wednesday, July 14, 2004, we are honored to be holding a reception and dinner for Senator John Edwards, the next Vice President of the United States. Please join us for a reception and dinner at 7:00 pm at the Hilton Chicago, 720 S. Michigan Avenue, Chicago, IL to celebrate the selection of John Edwards as John Kerry's running mate and to cheer the Democratic ticket on to victory. Here is a report from Sue, Salon Kerry's official Madame, about the Evanston event last night. Thirty-five Kerry supporters attended this week’s Salon Kerry Night at the Firehouse Grill, 750 Chicago Avenue, for a night of campaign discussion, strategizing and friendship. This was only our second week of holding Salon Kerry at this new location and it has worked out great. We have the use of the entire upstairs room and there is better parking plus it is located less than a block from the Main Street El and Northwestern train stop. During the evening, several announcements were made about the numerous upcoming events and programs, in which volunteers were needed. Sue began by asking volunteers to join the Kerry Media Corps and explained what that entailed and how to join. Julie announced that she was hosting a Move-On.org volunteer phone party at her home in Evanston to register new voters this Sunday, July 11 from 6 to 8pm. Joanne reminded everyone that the Democratic Party of Evanston’s Progressive Dinner for Progressives was coming up on July 18 and urged everyone to come. Thea discussed the need for database help to maintain our quickly growing list of volunteers (keep em’ coming!). Daniel announced that this coming weekend there are three festivals (Wilmette, Park Ridge, and Lincolnwood) in need of volunteers for handing out Kerry info. John announced that anyone interested in attending the Peter, Paul and Mary concert at Ravinia, (a great Kerry social event) should contact him. Following our announcements, everyone in attendance had a great time planning new projects and making new friends. Overall, these nights have resulted in many new friendships and stimulating conversation. Well, the Kerry Volunteer Dance Instructors showed their stuff on the dance floor once again this Wednesday. This time round it was the "Deep House" Superjane Collective featuring DJ Colette, DJ Heather, and DJ Lady D. The absolutely fab music was interrupted only intermittently by rain showers. As usual the Kerry Volunteer Dance Instructors attracted a considerable amount of positive feedback as they danced and handed out their Kerry lapel stickers. Comments included, "I'm not sure about Kerry but you sure can dance" (person obviously needs more work) and "It's so great to see a bunch of happy Democrats"! You can find this bunch of Happy Democrats weekly at DJ Wednesdays in Grant Park at Michigan Ave. and Harrison -- 6:30pm-9:30. The Hyde Park 4th of July Parade was all for Kerry! While we were getting ready to march, an overwhelming majority of the other participants in the parade eagerly agreed to wear John Kerry stickers and even offered to carry signs for us. A driver in the parade came running up to ask us for a large Kerry yard sign to display on the hood of his SUV which was in the parade. Joanne Yao, Emily Boening, Marieke Guillen-Treadway, Gabe McArthur, Christopher Greenwald and Susan Hoffman marched through the streets of Hyde Park spreading Kerry cheer. It was a huge success! Thanks Hyde Park for Kerry supporters! You made it clear to our community that we are united and ready for a positive change in the White House! About 30 Kerry and Obama supporters marched together and for each other. We had marchers from 3 yo to late 70's. We chanted "Vote, Obama, Kerry, Now!" the whole way despite being between 2 musical groups. There was a Christian Rock band in front of us. The Summersnowmen.com group behind us played the recording, "Let it snow, let it snow, let it snow" - they were a hoot! We were well received on the first half of the parade route in the northern side of Brookfield but the applause decreased considerably for the second half. We tossed candy, handed out buttons, stickers, bumper stickers and leaflets. We didn't pace ourselves and were almost out as we started the second half. This less supportive crowd didn't miss it, except for the kids without candy, :(. A WWII veteran was very pleased to accept a Veterans for Kerry button from me. My 7 year neighbor Joey begrudgingly agreed to get up early and march with us. He and Kerry both like to play hockey, see. He finished the parade with a big smile, sticky with candy residue, and agreed that he had a great time. What a great 4th of July! See pics from the 4th of July parades, Nora at the Brookfield Independence Day Parade, John Moore at the Hyde Park 4th Parade, the Skokie 4th Parade and the Evanston fourth of July Parade. And don’t forget the Kerry crew who worked the Taste of Chicago on Saturday. Please post your comments about the events of this weekend. Did we miss any events? The picture below is from the Evanston parade where 200+ upbeat Democrats marched to loud applause and in some sections standing ovations. The Kerry and Obama line was half a football field in length and bursting with enthusiasm. When passing the Republicans on the parade route, they started chanting “4 more years.” In response, Kerry supporters showed quick whit by starting a chant of “4 more months.” This cheer ended up being the best received and most fun on the march! Sen. Durbin even dropped by to talk and take pictures with Kerry supporters after the parade. A special thanks does out to Shira Gordon and her mother for providing T-shirts for 140+ Kerry supporters. 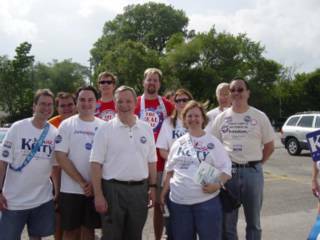 Thanks also to the Democratic Party of Evanston and Larry Suffredin for providing a fantastic pre-parade barbeque. Sen. Durbin, St Sen. Jeff Schoenberg, DPoE, Obama and Kerry Supporters! Great to see Bill and Stacy, Bryce and Zoe at the Evanston parade! For those of you who have not meet the Bogans, they were one of the most active Kerry supporters though the primaries before the twins were born. Stacy was eight months pregnant and sacrificed to let Bill work with the group in Davenport, Iowa on the weekends. Now that is dedication! We love you guys! Visit the Bogan's baby page here. Pictured below are five of the original July 03 Kerry Meetup members from the Café Mozart in Evanston: Joanne, Bill, Daniel, Stacy and Jennifer with Bryce and Zoe. Last night was an evening of music and politics at the Lyric Opera House. Musical acts included Ben Sidran's jazz trio, Big Time Sarahand the Teardrops, American Idol favorite Jennifer Hudson, and Chicago Samba. Speakers ranged from Studs Terkel to Mort Sahl, Diana Kerry to our new Illinois Field Director Avis La Velle. Even Senator Durbin spoke, supporting both Kerry and the local Senate front-runner, saying "Tell your Mama, tell your Papa, America needs Barack Obama." Kerry supporters from all across the state were also in attendance, and greeted the headlining speaker Bill Clinton with a warm ovation once he appeared. The former President spoke of the key differences between the Republicans in power and candidate John Kerry. He noted the cost of the Bush tax cuts. He noted that after-school programs have been cut, police officers have been let go; that port security remains ineffective, and that National Guard soldiers continue to go without health care. President Clinton stressed that people in the audience go away with these examples firmly in mind. "Not even 5% of America knows about this -- you've got to get out there and tell your family and friends," he said. Judging by the enthusiasm of last night's crowd, his words did not fall on deaf ears. Note, see Gary's great write-up in the Comments Section! The Creatives for Kerry event was a big success. We raised over $30,000 and had around 200 attendees. food and everyone had a great time. The Creatives for Kerry Fundraising Event took place on Wednesday June 20 at the West Loop Studio in Chicago. For more information on Creatives for Kerry, please see their site. Well, Pridefest went very well for the DNC. We collected over 1000 names and handed out 2500 stickers and 500 buttons and 350 bumper stickers. We also gave out bunch of signs to anyone who wanted them. Pride went GREAT. We had about 65 marchers. We had Elizabeth Birch in the Yellow Thunder bird and some great people. We handed out 17,000 stickers and it looked great walking around with people covered in Kerry stickers. I went back and handed out Stonewall and DNC stuffout and got petitions signed until I was super tired. Once again, the ChicagolandforKerry Volunteer Dance Instructors wowed the crowds at the DJ concert in Grant Park with their signature mix of dance finesse and political savvy. Kerry stickers were in great demand. Featured DJ was Ralphi Rosario. He played an interesting mix of remixed 80's pop and tunes with a softer almost Latin flavor. Comments from the admiring crowd included, "you dance like a professional" (to Tanya) and "do you really like this music? Will you be here next week?". We danced from the first tune to the last. We also went through a whole roll of stickers. Note, DJ Wednesdays will be running throughout the summer and feature some of the most well-known DJs in House and Club Music. See the Full Schedule.